St. Johns River State College shortstop Nick Owens was named the 2017 recipient of the John C. Tindall Endowed Scholarship. The sophomore from North Carolina will further his education in business information technology at Virginia Tech this fall. Ross Jones, SJR State head baseball coach and athletic director said, “Nick Owens epitomizes the term student -athlete. He is a young man that is the total package and a model of what we are looking for at SJR State. We are so proud of Nick and his accomplishments as a Viking." For the 2016 season, Owens appeared in 55 games for the Vikings, accumulating an impressive .350 batting average with 51 runs, including four doubles and two home runs, 25 RBIs and seven stolen bases. Equally impressive defensively, Owens had a .921 fielding percentage with 31 double plays for the Vikings and was named to the All Mid-Florida Conference second team. More recently, Owens was named the state player of the week by the Florida College System Activities Association (FCSAA). During the voting period, Owens batted .833 with one home run and three RBI. The criteria for the Tindall scholarship include demonstrating exemplary work ethic and leadership, as well as quality performance in the classroom and on the field. The scholarship was established in honor of former coach John Tindall, who devoted 30 years to coaching the Vikings through 591 wins and nine Region VIII tournament appearances, placing him in the nation’s top 10 for career wins at the time of his retirement in 1997. In 1961, the Vikings took the field for the first time and have since dedicated the past half century to building a solid reputation for producing superior student-athletes. The College has continued its tradition of producing a strong baseball program with facility improvements including a covered practice facility, dugout and field renovations, and most recently, new grandstands. 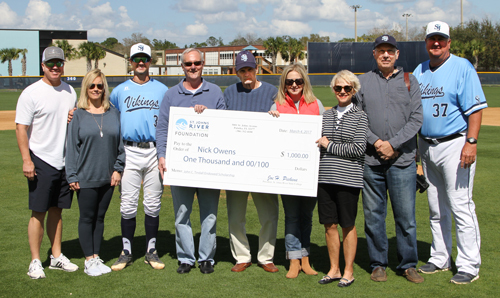 Viking shortstop Nick Owens was recently named the 2017 recipient of the John C. Tindall Endowed Scholarship. From left are John and Stacy Owens, Nick Owens, SJR State President Joe Pickens, John Tindall, SJR State Vice President for Development Caroline Tingle, SJR State Foundation board member Joyce Oliver, SJR State Trustee Brian Keith and head baseball coach Ross Jones.